We’re now deep into September: School is back in session, vacations are over, and we’re all trying to get back into that groove that we had down to a science only a few months ago. I have aspirations this fall of trying to get back to the gym once in a while, maybe—dreaming big, here—even adding a yoga class. But like everyone else, I find it difficult to cram everything into a single week, and am desperate for shortcuts where I can find them. So I have always been intrigued by the notion of the one-pan supper. It has to be easier than any other kind of supper, right? Throw everything into a single pan, and then eventually onto various plates. Dinner is served. So I will be on the lookout for the one-pan supper this particular school year (please, send me your suggestions in the comments below!). 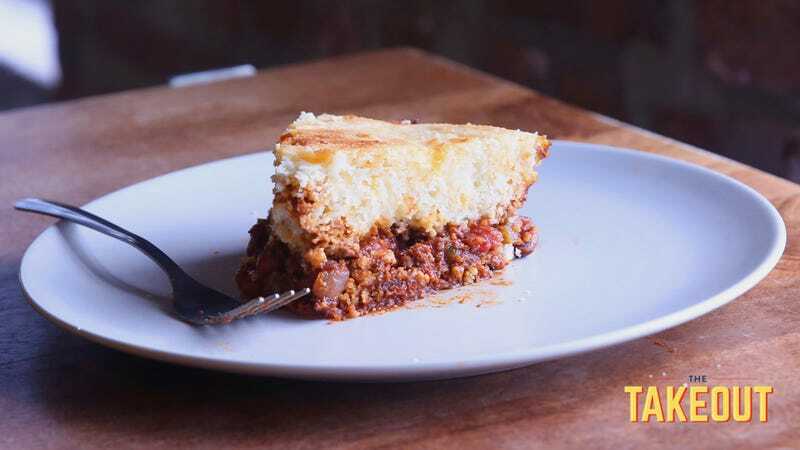 To kick off, I decided to try a one-pan dish I’ve always been intrigued by: the chili-and-cornbread pie, baked right in a cast-iron skillet. What could be easier? As it turns out, quite a few things, but the compactness of chili and cornbread in the same pan was not something I could pass up. I have honed my chili over many years, finding my secret in adding a bit of crumbled sausage and a variety of spices, including cinnamon. So I made a version of that in the skillet, and then smoothed a cornbread batter on top. This was the tricky part: too much batter and you get cornbread-with-chili instead of the other way around. If you smooth the batter too roughly, the chili pokes through and the whole thing gets rather unsightly. But once it’s assembled, it bakes in a neat 30 minutes, and my one-pan autumn was off to a roaring and extremely comforting start. Note: If you do not have a husband who loves to collect cast-iron skillets like I have, you can still cook this in a casserole dish. Yes, then it will be a two-pan supper. Upside is, you probably don’t have at least one evening a week wherein my husband enjoys his favorite hobby—seasoning the pans in the oven—which makes our whole house smell like an auto mechanic’s garage. In a cast-iron skillet that’s at least 12 inches wide, brown the sausage and beef together with the onions, garlic, and peppers until the meat is brown and the vegetables soft. Then add the tomatoes, beans, and spices. Let the chili simmer and cook down for about 20 minutes. While the chili cooks, mix together the dry ingredients for the cornbread: flour, cornmeal, baking powder, and salt. In a separate bowl, mix the milk, eggs, and butter. Then mix the dry and wet ingredients together. Then add the cheddar cheese. Carefully smooth the cornbread batter in a light layer completely over the chili in the skillet. Then bake the whole thing at 375 degrees Fahrenheit for 30 minutes or until the cornbread is browned. Brush top with melted butter. Cut into wedges and serve.